This resort is currently under construction and is expected till about 2018. The pool was completed in the summer 2017. The levels of noise can vary from day to day from heavy equipment to finish carpentry. Red dirt can settle on the lanai decking but cleaning supplies are under the sink for guests to use if need be. Construction hours are Monday - Saturday 8AM to 5PM. Your on-island contact is Graeme D. Merrin, RA, ABR, GRI (808) 651-7211. graeme@graememerrin.com When calling the on-island contact and there is no answer, please always leave a message. Circumstances such as driving can interfere with the ability to answer the phone. If you leave a message, it will help us to be able to respond, answer your questions or address any concerns in a timelier manner. The regular occupancy for 1H is 4. However the unit can accommodate up to 6 with the sofa sleeper. Guests are obligated to disclose the actual number of occupants prior to arrival. A pack-n-play and a high chair are available at no extra charge but must be requested via email to alohacondos@vacationreatlyhawaii.com at the time of booking or within 72 hours prior to arrival. If more than one pack-n-play or high chair is required, the second one is the guest’s responsibility to lease from a private rental company. Please make sure that all towels, beach equipment, remotes and property of the unit are left behind at the condo when you depart. Leave the keys back on the laminated sheet inside the condo and one house key in the guest lockbox. We charge replacement costs for each lost item (cost of item, travel time & accounting). We charge a $75.00 replacement fee for each lost key, a $100 replacement fee for a lost garage door remote, and a $150 fee for a pool FOB. Generally items are lost because they are left in the rental car, so please check your car carefully before you leave for the airport. Parking: This unit does have a one car garage for the guests to use. There also is one outside space for the guest to use which is #6. Do not park in any ther parking space other than the assigned. Parking is also allowed outside the complex on Kaihuna Plantation road. Hurricane or Storm Policy: No refund will be given unless a “mandatory evacuation order” has been given by the National Weather Service for this area. In the event a mandatory evacuation order is issued, we will refund unused portions of rent of a guest currently occupying the property and any advanced rents or deposits collected for a guest that is scheduled to arrive during the Hurricane Warning period. This was my first visit back to Kauai after 10+ years. Pili Mai condo 1H was very well equipped and very nicely decorated. I used the 2nd bedroom, and had my daughter and son-in-law use the master bedroom. The beds were great! Kitchen is very well-equiped with everything we needed for preparing meals and eating in, when we chose to. FYI - From my experience with other Aloha Condos properties on the Big Island, I had expected/hoped that some basic refrigerated condiments, such as ketchup, mustard, mayo, etc might have been left by previous guests. That was not the case here - there were some dry spices in the cupboard, but the refrigerator was cleaned out. From a liability standpoint, I can understand this owner’s perspective to avoid leaving such goods that could be beyond expiration dates, so they should not be faulted for a cautionary approach in the interests of guests. Just know that you need to plan to purchase those items on your initial shopping trip. I do not fault the owner or the property for this; my comment is for reference only, in case others have expectations similar to mine. Pili Mai condo 1H is a beautiful, pleasant condo. We used the pool and spa several times - those are also very nice. I will definitely try to rent it again the next time I visit Kauai in the next few years. Thank you for making it available to vacationers. Unit 1H at Pili Mai could be your next home away from home! This lovely brand new 2 bedroom, 2.5 bathroom unit is sure to please any guest with all new furnishings and stocked to make you feel as if you are right at home. The upgrades in this unit will appeal to all with rich wood cabinetry, upgrades of granite, marble, travertine and wood flooring. The ground floor level is convenience with no steps to climb and easy access directly from the garage to the unit. The complex amenities are a nice option for extra fun at the sparkling pool, the hot tub and you can even get a workout at the fitness center. 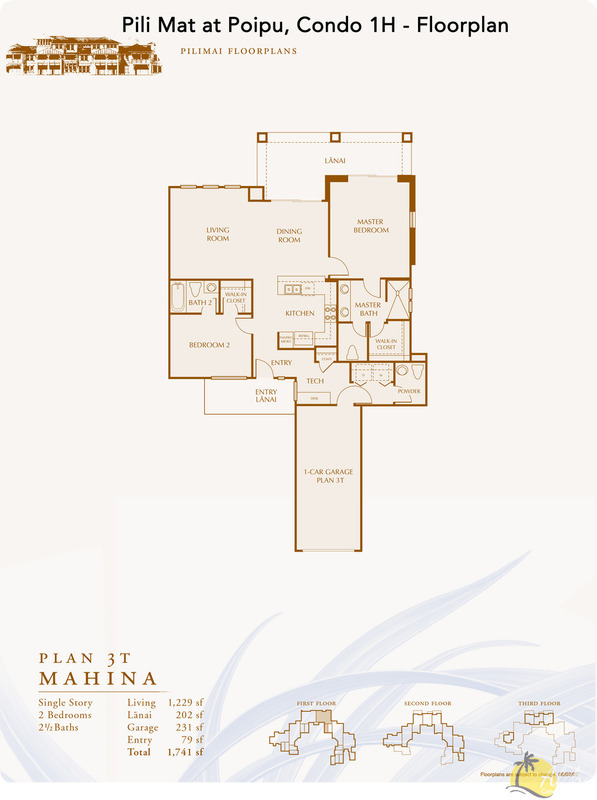 Close to all Poipu's amenities and activities, you are right where you want to be for convenience and fun! With the surrounding golf course, the tropical landscaping and the ocean just a short distance away, you will realize your place in paradise! One outside space directly in front of the garage which is space #6. This was my first visit back to Kauai after 10+ years. Pili Mai condo 1H was very well equipped and very nicely decorated. I used the 2nd bedroom, and had my daughter and son-in-law use the master bedroom. The beds were great! Kitchen is very well-equiped with everything we needed for preparing meals and eating in, when we chose to. FYI - From my experience with other Aloha Condos properties on the Big Island, I had expected/hoped that some basic refrigerated condiments, such as ketchup, mustard, mayo, etc might have been left by previous guests. That was not the case here - there were some dry spices in the cupboard, but the refrigerator was cleaned out. From a liability standpoint, I can understand this owner’s perspective to avoid leaving such goods that could be beyond expiration dates, so they should not be faulted for a cautionary approach in the interests of guests. Just know that you need to plan to purchase those items on your initial shopping trip. I do not fault the owner or the property for this; my comment is for reference only, in case others have expectations similar to mine. Pili Mai condo 1H is a beautiful, pleasant condo. We used the pool and spa several times - those are also very nice. I will definitely try to rent it again the next time I visit Kauai in the next few years. Thank you for making it available to vacationers. We so appreciate your 5-star rating and taking the time to post a review! We do strive to make the condo a place that you will want to return to and have all that is needed for a great vacation! In mentioning the condiments, you are correct. It is a liabillity and we do not supply them for that reason. Besides the liability, the monitoring of the expirations becomes even more of a liability. Most guests also would feel uncomfortable using an opened product so therefore we remove anything that is left from previous guests. We are glad you enjoyed the condo and the complex amenities and do hope you can return soon! great condo had everything you needed, The bike chained up in the garage was in the way to park the minivan in the garage. Thus we had to park outside and walk on the grass/dirt, not a good design for a driveway at all. the people upstairs never stop moving or making noise. Had to close windows and doors because of the neighbors a/cBedding was nice, living room furniture very uncomfortable Close to all we wanted to do. Safe neighborhood.. Thank you for taking the time to post a review in response to our request for the unit 1H at Pili Mai in Poipu. We are happy to hear the condo had everything you needed. We have not had any other guests mention, the parking in the garage to be a problem but we will look into that and try to move the bike to a better location within the garage. The other assigned outside parking space for this unit is directly in front of the garage which is on concrete which leads to a concrete sidewalk right up to the front door so we are not sure why you had to walk in dirt or grass?? This unit is on the ground floor making it convenient without steps but it does mean you have people above you in a condo scenario. Thank you for your comments on the nice bedding. This unit has all brand new furnishings including the living room furniture. The Pili Mai complex is in a great location as you mentioned, close and convenient to shopping, restaurants and beaches!